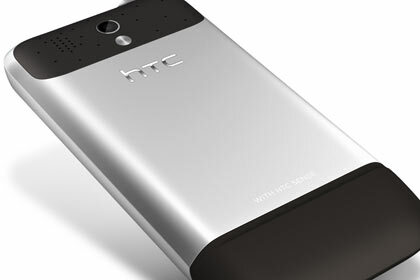 The HTC Legend may lack the extra-large screen of the flagship HTC Desire, but the unibody aluminium casing is a superb piece of industrial design. The Legend is an excellent smartphone and a solid improvement over its predecessor. Featuring a superb, Apple-esque design, HTC's latest Android smartphone — the HTC Legend — is one of the sexiest looking mobile phones we've ever reviewed. The successor to the HTC Hero, the HTC Legend is not just about looks: it offers improved software and superior performance. Like its predecessor, the HTC Legend smartphone has a very distinctive design. This time it's thanks to the aluminium, unibody casing with a brushed finish. Like Apple's MacBook Pro, the Legend's unibody casing is carved from a single block of aluminium, so there are minimal moving parts. The result is a phone that possesses superb build quality and is a delight to hold and use. 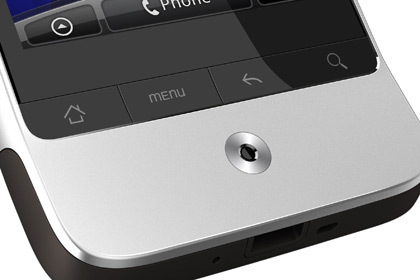 The unibody construction means the HTC Legend doesn't have a regular battery cover on its rear. Instead, a small, rubber cover sits at the bottom of the phone, and slides out to reveal the battery, microSD and SIM card slots. You'll need to turn off your phone to replace the SIM or the microSD card — the plastic cover concealing both slots holds the battery in place. The HTC Legend's body is carved from a single piece of aluminium, making it one of the most distinctive looking smartphones on the market. The HTC Legend once again has an angled lip at the bottom of the phone (often referred to as a Jay Leno chin in the US), but it's less pronounced than on its predecessor. The angled design houses the Legend's controls — the trackball has been replaced by a more responsive optical track pad and the answer and end call buttons have been removed. Four plastic keys sit just below the display (home, menu, back and search), but these feel spongy when pressed — the only real flaw with the Legend's build quality. The HTC Legend boasts a 3.2in AMOLED display, making it smaller than both the iPhone 3GS (3.5in) and HTC's own flagship Desire (3.7in). We found it a good size for portability: the Legend is easier to pocket and more comfortable to carry around than the bulkier Desire. However, this leaves less real estate for the on-screen keyboard. The presence of haptic feedback and excellent spelling correction are benefits, but the iPhone's on-screen keyboard remains more polished than its Android counterpart. Though it runs the latest version of Google's Android operating system (2.1 at the time of publication), the real star of the Legend is HTC's Sense user interface. The latest upgrade includes a number of new features, headed by the ability to pinch the home screen to quickly display and select one of seven screens — called Leap — and a new widget called HTC Friend Stream. The latter integrates all of your social-networking contacts, including from Facebook, Twitter and Flickr, into one organised "stream" of updates. This means you don't need to access separate applications to view this information, and you can update your status on Facebook and publish a tweet simultaneously. Though this feature looks superb and integrates seamlessly into the Sense UI, it lacks some more advanced features, such support for multiple Twitter accounts and URL shortening when tweeting. Other HTC-exclusive widgets include People — which combines all forms of contact with an individual in your phonebook — as well as News, Facebook, Web Bookmarks and HTC's much-loved weather widget. The last of these offers fantastic animations, including a windscreen wiper that swipes across the screen to wipe away raindrops. Another widget worth mentioning is Footprints. This allows you to take a geotagged photo and store the image in a particular category; for example restaurants or shopping. You can then instantly share the content with others via e-mail. HTC Sense has a strong focus on customisation, and the ability to completely change the interface's look and feel is a huge advantage the Legend holds over the iPhone. 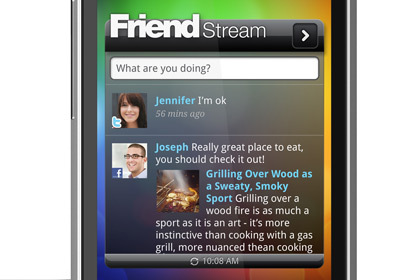 HTC Friend Stream is a new feature of the updated Sense UI and integrates all of your social-networking contacts into one organised "stream" of updates. Another advantage the HTC Legend holds over its predecessor is improved performance. Though the Hero was no slouch, it often took a little a while to load particularly taxing applications such as the camera. The Legend has no such issues, and we didn’t encounter any lag or slowdown. It may not boast the same 1GHz Snapdragon processor that powers HTC's Desire and HD2, and Google's Nexus One, but for day-to-day tasks, the Legend is snappy. Underneath HTC Sense, the Legend offers the regular features and functions of Android 2.1, including the Android Market for third-party apps, an excellent notifications taskbar and automatic and seamless synchronisation with Google services. The phone automatically synchronises your Google calendar, mail and contacts over the air. Unfortunately, you still can't choose to save downloaded apps to the microSD card, and the Legend remains an inferior multimedia smartphone when compared to the iPhone. For example, the music player interface is intelligent and attractive, but there is no way to synchronise an iTunes playlist without third-party software and no real advanced settings beyond basic playlists, repeat and shuffle modes. Browsing the Web on the HTC Legend is excellent and the included browser supports Flash and multitouch. The pinch to zoom function isn't as smooth as the iPhone's, but double tapping or zooming in on a block of text automatically reformats the text, making it easier to read. Other features of the HTC Legend include a 5-megapixel camera with autofocus and flash, a built-in accelerometer, a digital compass and a GPS receiver. Battery life is similar to the iPhone 3GS' — with push e-mail, location services and background data enabled, the Legend will not last more than a full day. The HTC Legend is exclusively available through Vodafone and 3 mobile from June 3, and can also be purchased outright for $599. Online store MobiCity is also selling the HTC Legend outright and unlocked.